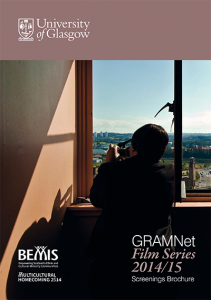 The 2014/2015 Film Series is organised in partnership between GRAMNet (Glasgow Refugee and Asylum Network) and BEMIS Scotland. The aim of Multicultural Homecoming 2014 is to celebrate and promote the cultural diversity of modern Scotland and recognise the reality that Scotland’s heritage and culture is a ‘living tradition’. This means as a nation we are continually evolving and this will be refl ected in the cultural heritage of Scotland. This year we will showcase films and documentaries that feature themes of home and homecoming, both for people whose journeys lead them to make new homes elsewhere or who return to places that were home before, and for the communities that they come to live with, or whom they leave behind. Our emphasis is on the complexities of home, the emotional attachments and detachments that often accompany migration. Following each film, invited local organisations and community groups will suggest positive actions that can be undertaken locally to address one or more of the issues raised in each film. Events are free of charge and open to everyone. To guarantee a seat, tickets can be booked by visiting the CCA website: www.cca-glasgow.com. Tickets must be collected from the CCA Box Office by 5.45pm, otherwise they will be released back into the system. Sponsored by GRAMNet and BEMIS with the support of the Equality and Diversity Unit, University of Glasgow. For more information on these films and the screening series, please see the 2014/2015 Screenings Brochure.